A new automobile year may have just begun for many Nigerian families, particularly ardent lovers of Toyota cars with the unveiling in Lagos of the eighth generation Camry, a completely transformed and reengineered model. It was the same excitement the launch of the all-new Camry elicited across America and Europe some months back when it was launched there. Although the Camry has since its first introduction to the global market in 1982 remained one of the best selling family cars on account of the Toyota brand’s functionality and reliability, it has not stopped auto reviewers from criticising it as somewhat boring. Toyota may have shut the mouths of such critics with the latest generation of Camry as it has been made sportier, combining functionality with style, power and comfort. The Managing Director, Toyota Nigeria Limited, Mr. Kunle Ade-Ojo, at the press launch of the vehicle in Lagos last week described it as another masterpiece from the stable of Toyota Motor Corporation Japan to the Nigerian automobile market. Ade-Ojo, who spoke through the TNL’s General Manager, Corporate Services, Mr Bunmi Onafowokan, said the new car had come with upgraded, trendier exterior and spacious interior design, adding that it “will readily arouse in its lovers a driving pleasure unparalleled in its class. According to Ade-Ojo, the Camry as a model has enjoyed a high level of goodwill and acceptance not only for the superior quality engineering behind it but also for its stunning beauty. “It may be expedient to mention that as of 2015, over 18 million units of this delectable model have been sold across regions. It is no exaggeration that the rich history of this model already imbues it with outstanding attributes peculiar only to all its siblings in our model line-up,” he said. Details of the new Camry’s features including its selling points were revealed by the TNL’s Brand Manager, Mr Bayo Olawoyin. He said the vehicle had been specially built to offer quality improved ride control, quietness and an “interior that projects an immediate feeling of excellence on the one hand and a driving experience that everyone appreciates” on the other. According to him, the models being introduced to the Nigerian market, 2.5 litre and 3.5 litre petrol engines, will impress many with their cool features, which are evidently a collection of luxury, high tech, and safety quality. 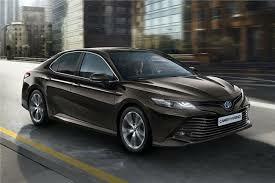 He listed some of the striking features fitted to the new Camry to offer owners real value for money as back monitor with pedestrian detector, intelligent clearance sonar rear cross traffic auto brake, adaptive front lighting system, rear electric sunshade, rear electric reclining seats, electronic parking brake. He said, “Camry’s newly developed direct shift 8-Speed automatic transmission improves acceleration from a stop, provides a smooth ride even at high speeds and helps enhance fuel efficiency. Talking about performance, Olawoyin explained that the new Camry’s high efficiency, high-powered next generation Dynamic Force Engine, powerful acceleration and new direct shift 8AT contribute to the car’s low fuel consumption. To ensure high quality ride, the car has been equipped with light weight high rigidity body and new suspension, new double wishbone rear suspension system, low centre of gravity, resulting from overall height, floor height, lowered hood, high rigidity body with a 30 per cent increased torsional rigidity. It also has new four-point engine mount to reduce engine vibration transmitted to the cabin; sound deadening and sound insulation material with increased areas and thickness. The car has high strength cabin and collision support body to effectively absorb and disperse shock. It is also credited to have the segment’s leading advanced human machine interface and easy-to-read information display screen, easy to see 8-inch audio system, sporty space that surrounds the driver and increased cabin space. The available 7-inch colour Multi Information Display will also display your current and average fuel economy, compass heading and audio presets. The all-new Camry offers 8-inch Multi-Media touch screen and available six speakers, 800-Watt Entune 3.0 Premium Audio, an audio system that makes people feel more at home. According to Olawoyin, the car comes standard with an Advanced Airbag System with advanced dual-stage SRS driver and front passenger airbags, in addition to front and rear side curtain airbags. There are nine airbags in all and all focuses on your safety. When the brake-hold switch is on and the transmission is engaged other than Park or Reverse, the brake is automatically applied. In fact, the electronic parking brake will automatically engage after three minutes if the car has not moved.